GUELPH, Ontario — Horse racing is arguably just as much America’s pastime as baseball, with a Triple Crown feat — wins at the Kentucky Derby, Preakness, and Belmont — as one of the most sought after accomplishments for owners, trainers, and jockeys from around the world. 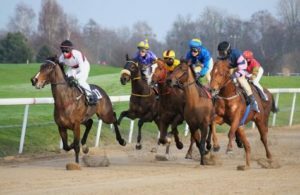 But a new study could change the way many fans and participants feel about the beloved sport: researchers say intense exercise can actually be fatal for racehorses. After studying 1,713 racehorses from the Ontario racing industry that died between 2003 and 2015, researchers from the University of Guelph in Canada determined participating in races, along with intense exercise used in training regimens, played a role in some of the deaths. A new study could change the way many fans and participants feel about horse racing: researchers say intense exercise can actually kill racehorses. Musculoskeletal injury — such as fractures or dislocations — was found to be the leading cause of death among all three breeds, though thoroughbreds and quarter horses were more prone to fatal accidents or sudden death. Ninety-seven percent of deaths were attributed to euthanasia after suffering a severe injury. Three breeds of horses were looked at in the study: thoroughbreds, quarter horses, and standardbreds. Thoroughbreds showed to be most at risk from racing. For every 1,000 races, 2.27 deaths were exercise-related. On the other hand, standardbreds had the lowest rate of death associated to racing, at just 0.28 deaths per 1,000 races. Quarter horses fell closer to thoroughbreds at a rate of 1.49 deaths for every 1,000 contests. The study is the first to compare death rates among the three racing breeds. “The study reveals parallels between mortality and the intensity of the overall management of the horses, their lifestyle and the type of work they do,” says Physick-Sheard, Department of Population Medicine. Horse gender may also be a factor in lifespan. Young stallions showed to be at greater risk of death than mares or geldings. In older horses, however, geldings had a higher mortality risk. Thoroughbred stallions showed higher death rates than standardbred stallions. With these new findings, particularly when it comes to breed, gender, and age, Physick-Sheard says horse owners and officials could consider putting into place standards or strategies to reduce the number of race-related deaths while strengthening the health and well-being of the racehorses. Such modifications could also reduce the cost of participation in the sport. The full study was published in the Equine Veterinary Journal.